Last week I showed you the first part of Jamie and Josh's dining room/den swap and today I am so excited to show you the second part, because it's my favorite! 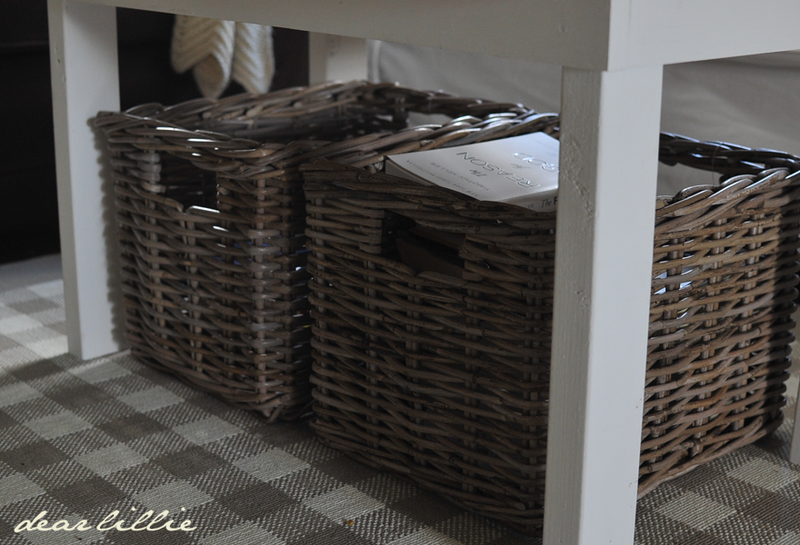 For a little refresher you can click on this post and see what it looked like before when it was their dining room. Because they have a nice little seating area in their kitchen they didn't regularly use their dining room and thought it would be nice to move their den to the room off of the kitchen to help with the flow and making it so everyone could all hang out together more comfortably in the area of their home that they spend the most time in. I have to say I am a HUGE fan of the switch! 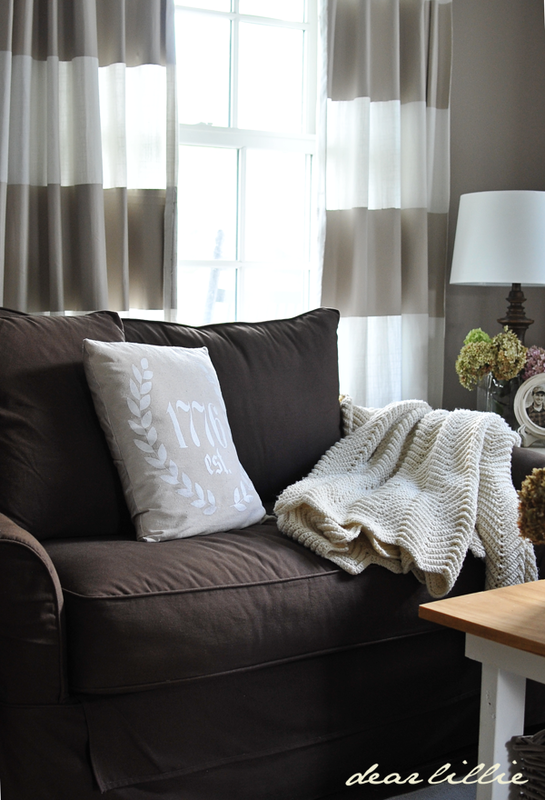 The first thing they did was paint the walls a slightly lighter color, Cotswald AF-150, by Benjamin Moore, to help provide a little more contrast between the chocolate love seat and the walls. Then they raised the chandelier (from Ballard Designs) seeing how the dining room table was no longer underneath it. 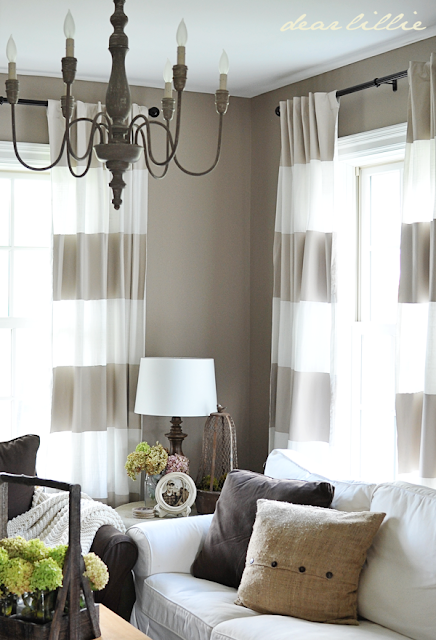 Pretty much everyone in our family has now fallen in LOVE with striped curtains. My sister Dana was the first one to go ahead and try painting her panels. She was looking for a fabric to make draperies for her new apartment in "the apple city" as Lillie calls it, and I suggested painting some panels. I had been wanting to try it in my master bedroom but admit I was a little scared to, but she was brave and gave it a try. She sent me a photo once they were up and I was completely wowed by how fabulous they looked and so I went ahead and made mine which you can see here including a photo of how I taped off the stripes. Jamie took on the biggest task, because she painted four panels! Dana and I were lucky and each just had to paint two. We all purchased our panels at IKEA and they were either $19.99 or $24.99 for a set of two panels. 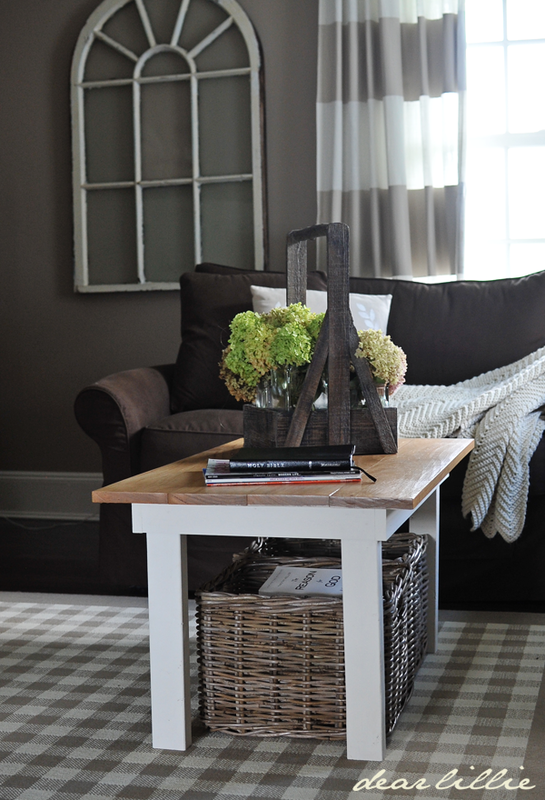 The rug and white slipcovered sofa in here are also from IKEA. 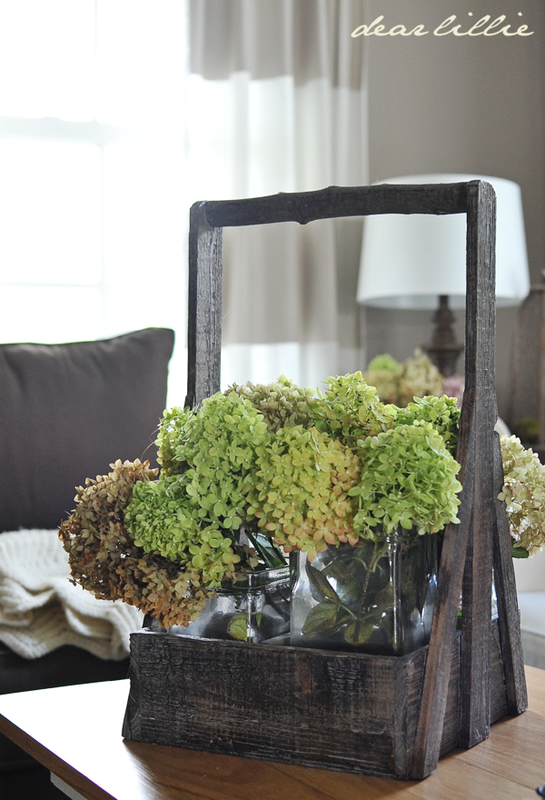 Fresh cut hydrangeas from their yard. Josh made this coffee table for Jamie! They still have two projects left in this room. First, Jamie is planning on painting the frames that she had in their other den ivory and hanging them on the blank wall. They are black right now and looked fine in the other room which had some black accents but will look better in a lighter color here. Once she gets that project done I will post some updated photos. The second project is finding a stand for their TV. I didn't even photograph that corner of the room (although the wall next to it is two photos down) because it's currently sitting on a random way too tiny piece from my parent's basement. The piece it was on in their other den didn't fit in this space. This is the wall to the left when you walk in. To the right of the chair on the right is where their TV is. Jamie's kitchen is connected to the den. Here are a couple of photos so you can get the feel of it and you can find more here and here. 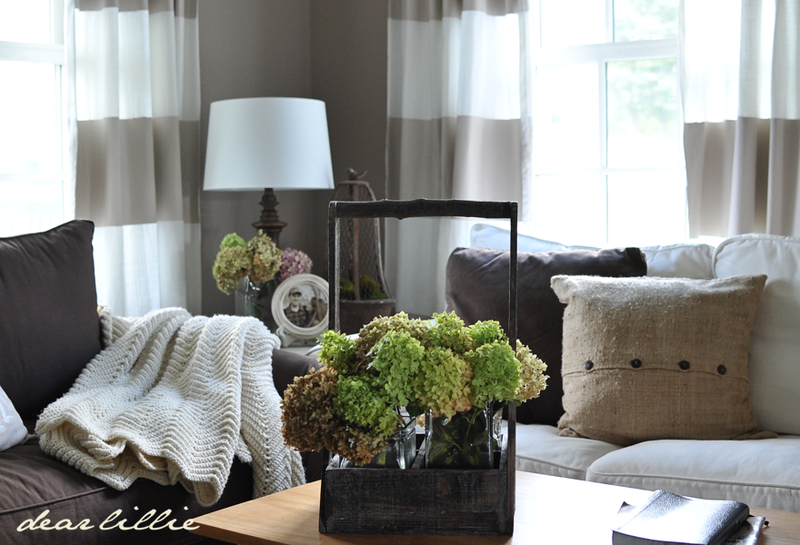 Jamie also made and painted this Roman shade last fall! 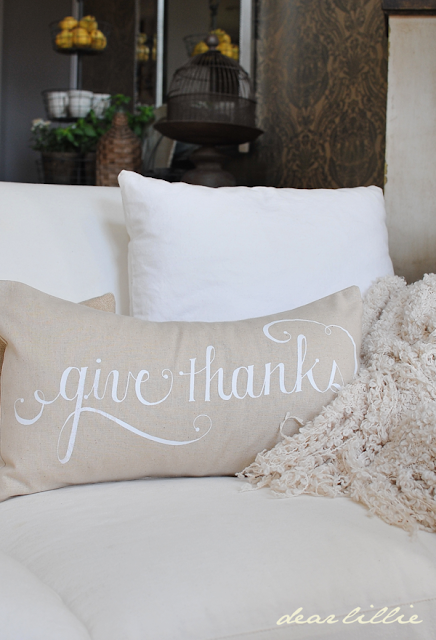 Also, I wanted to let you all know we now have our 12 by 20 give thanks pillow cover available in white! Such a gorgeous den! Her whole decor is just wonderful, like yours. I happen to love the den/family room by the kitchen, especially if it's an open concept. I think she made the right choice. Their den looks comfy. Love the drapes, and their beautiful flowers from the yard. That is a great flower holder! The paint is really nice too! Such a well done home! Thanks for sharing. Great idea switching those up to get better use of the space. Love the rug and I may need to paint some curtains. wow. wow. wow. the den looks so cozy and inviting. Where is that adorable mirror from in the kitchen?! I want it!! BEAUTIFUL..You and your family do amazing rooms..
Great to have both rooms together now! LOVE the wooden arched window frame. Where did she get it?? 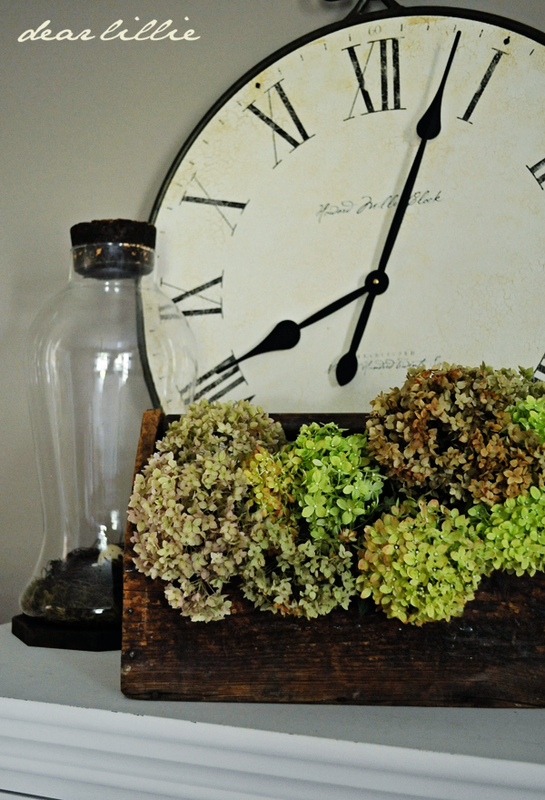 I got it at White Home Collections in Wilton, NH. Wow, its beautiful . Love the painted panels, and well all of it really! Oh my goodness...it is all SO beautiful!!! I'm sure I'll be looking at these photos again and again! 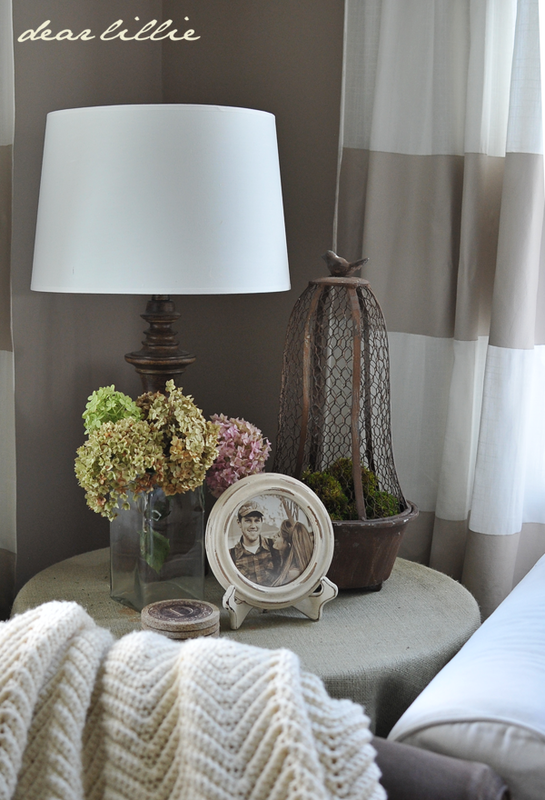 Warm & inviting... feels like home. I am in love with the striped curtains! Beautiful! Really great idea switching the rooms! 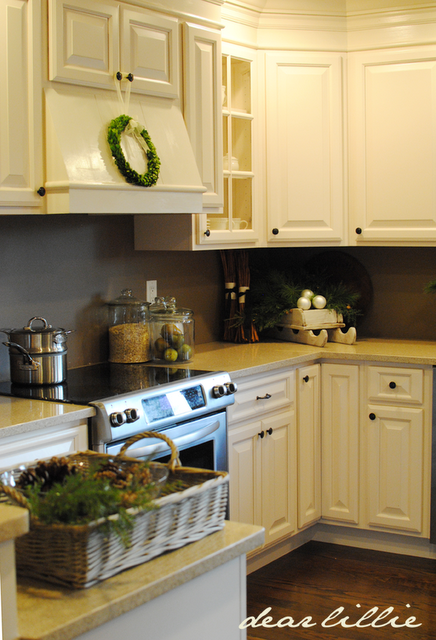 Do you happen to know the color name for the kitchen cabinets?? Unfortunately, I don't! It was just the factory cream from the cabinet company. We actually tried to buy some from them to use for the molding above the cabinets, but they wouldn't sell it or give out the formula, so we ended up having to have it color-matched at the building supply store my husband works at. They did a really good job though, and you can't even tell. If you have a hard time picking colors off of tiny swatches, you might want to try finding fabric or an object in the color you like and having a hardware store color match it. I love love love stripes!! I'll have to go check out how you painted them so I can do it too. Thanks for the gorgeous inspiration. What an amazing room!! Birthday Wrap has fun Birthday party games for kids and has endless list of first birthday party games for children. Creative and funny birthday party games for children of all ages. We serves in Delhi, Noida, Gurgaon, Faridabad, Ghaziabad and ncr regions for your children. Looks gorgeous!!! I love how she changes the paint color... I've always painted a room, and stuck with it forever! I want to paint my home office but there's crown molding.... Did she paint the rooms herself?how did she get it so precise around the crown molding? ( I think I see crown molding but I'm on my phone so I'm not sure) and my second question is regarding your harvest sign. Is that free hand? Or a stencil?if it's free hand what did you use to paint that? And if it's stencil - where did you get it, and what color paint did you use for it? Jaime's place is absolutely amazing! Love the room switch - gorgeous. Do you know which IKEA panel she used? I looked online and there are sooooo many! Also - must know where that fantastic magazine rack is from - thanks! 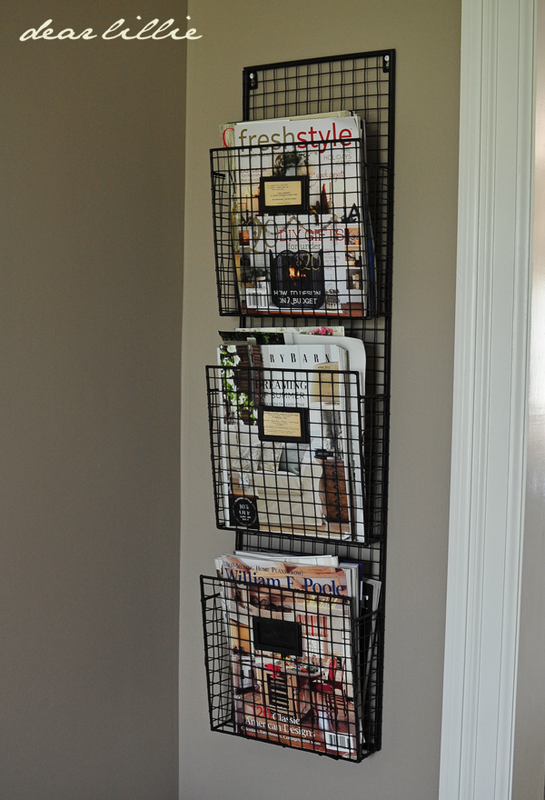 The magazine rack is from White Home Collections in Wilton, NH. I really like the painted curtain look, My question is would they be washable? after painting them are they stiff? I'm not positive if these particular ones are washable or not, as Jamie and Josh have never tried to with theirs. However, they do make washable pain now, so maybe that would work. Also, the painted stripes do end up stiff. I can't get the tutorial on painting the curtains to work. Very nice room. Luv the curtains. 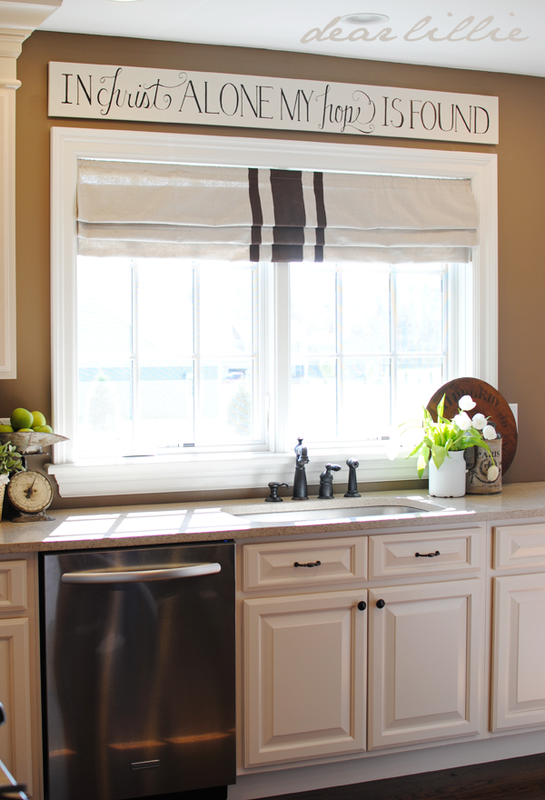 I love the roman shade on her kitchen window. 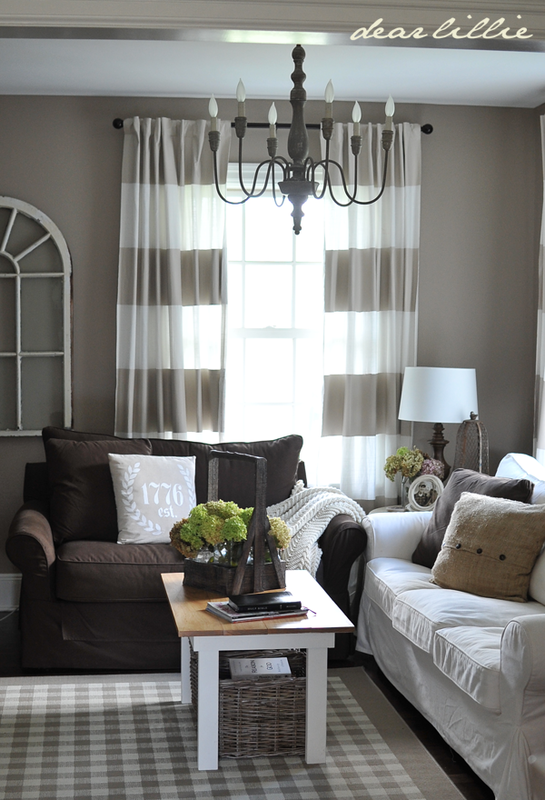 I am looking for one like that, where did she get the shade and is there a post on applying the paint to the roman shade....would it be same as curtan panels. Beautiful room, how is your house selling going and where do you plan to move...maybe I missed that post. Mickey in PA. It was super easy. Good luck! Hello Mickey - we just put a "for sale by owner" sign in our window and mentioned it on the blog but haven't made any other real attempts to sell our home. We are just planning on moving somewhere else here in Williamsburg. Once this basketball season is over we plan on getting a real estate agent to officially list our home and hopefully will be able to sell it. I have several old windows that I hung, but hate how you can see the wire above the window. How did you hang you window? We used a sawtooth hanger on the back of the mirror and a Wall Dog screw anchor rated up to 50 lbs. It was very easy, as the Wall Dogs will go into anything so you don't have to check for studs even if the piece is heavy! Awesome! So just any sawtooth hanger or did you get a heavy duty one? I just worry about it pulling away from the back of the window? It wasn't really very heavy duty, but if you're worried, use a heavy duty one. It can't hurt; you can only err the opposite way! Jamie, it all looks great! 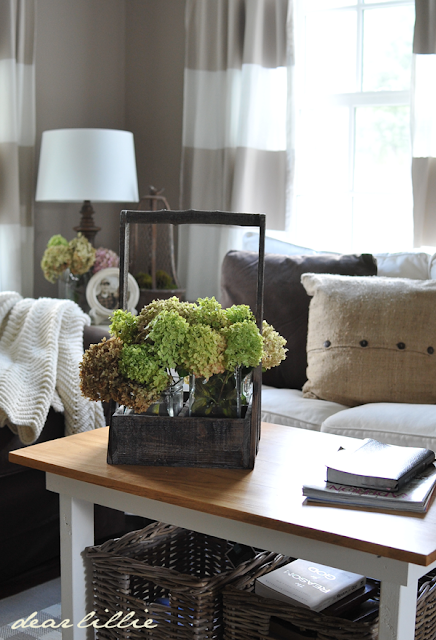 Hannah loves the neutrals you all use, and will be fixing up her "room" in the house she is sharing with a work friend in Middleburg, VA. Gotta ask if that is "The Reason for God" by Timothy Keller in the basket under the coffee table? It is my husband's FAVORITE, and he quotes something from it at least once/day! Hope all is well there. Thanks! I got it at White Home Collections in Wilton, NH. Pure loveliness! What a great transformation and use of space!!! It turned out great! Thanks for sharing these pictures. 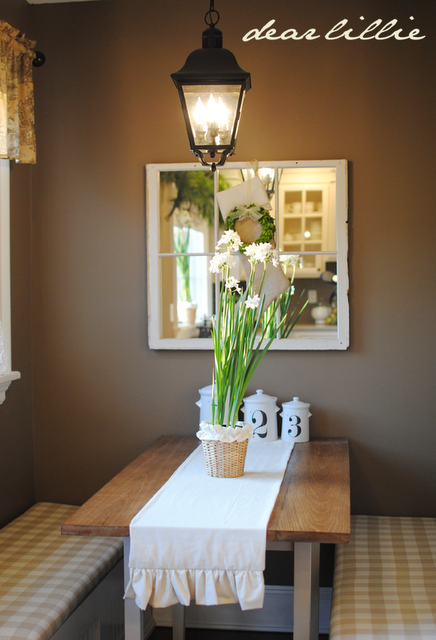 I LOVE the lantern above the kitchen room table. Can you share where you found it? I'm looking for something similar for our entryway. Thanks! I got it through my husband's building supply store from a company called Progress Lighting. What is the color of the living room!?? Love it and the old window. Indecently nabbed a similar magazine rack at TJ Maxx, for any one wondering of another source. I saw one just the other day at Marshall's! Might have to go back and grab it!! Thanks! It's Cotswald AF-150, by Benjamin Moore. Ps. *Recently auto spell iPad !! Beautiful, beautiful room. You all did an amazing job! Thanks for sharing. Can you tell me where you got your bird pictures hanging in your dining room? Love, love love these!! Also Jamie's slip cover from IKEA: is thick so you can not see through it? 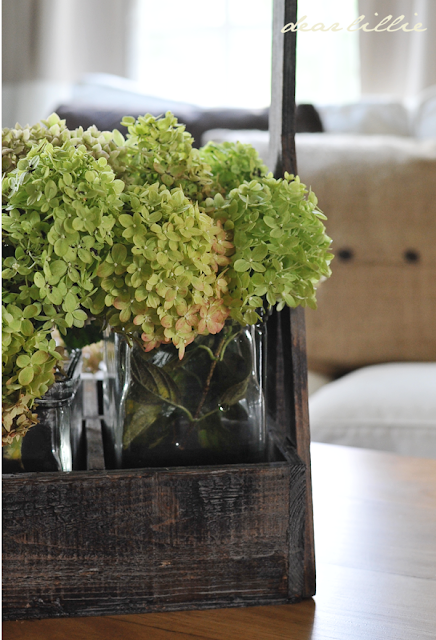 They were a gift from my mother-in-law and from a store here in Williamsburg called Savvy. I love them too! Yes, Jamie's slipcover is very thick and not see-through. Thank you Jennifer!!!! Kim B. Thank you Jennifer!! Kim B.
delhiballoons provide services in beautiful kids birthday party, kids birthday organisers. Balloons supplier in delhi & NCR. celebrate kids birthday party with delhiballoons organisers. Hi! The whole room looks amazing! I have been a follower for a few months but never commented before. I love both of your styles! Can you tell me where the curtain rods are from? Are they black or ORB? And are you happy with them? I have been looking for some just like those! Thank you! The curtain rods in the den are from Sears. I bought them on clearance when our local one went out of business. They are ORB, although I had wanted to find black ones. I'm glad I wasn't too picky, though--you really can't tell the difference unless you get up close. Some ORB ones have a noticeable red undertone, but as long as you get ones that don't, I think it's very hard to tell once you get them hung and put curtains on. I love what you've done, especially the kitchen! I love the chocolate loveseat. Where is it from? The chocolate loveseat is from Ballard Designs. 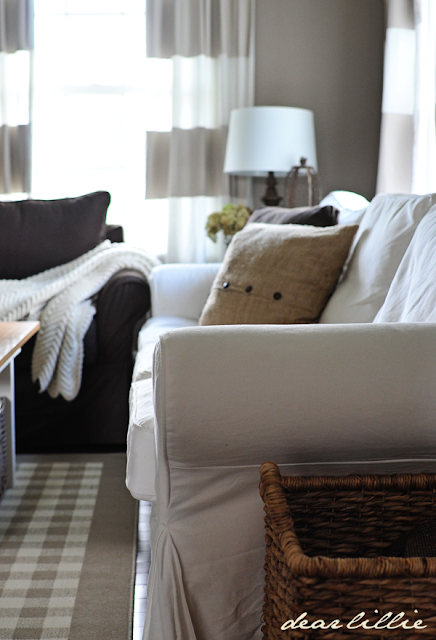 I absolutely love every inch of this room, and i have been looking for a couch similar to this one everywhere! Would you be able to tell me where it was bought and/or what the style or type of sofa it is so my search might be more successful? I bought the sofa at Ikea and it is an Ektorp with a white slipcover. The brown loveseat, just in case you were talking about that one instead, is from Ballard Designs. Hi! I just love the idea of painting curtains and since I live on a very tight budget this would be great! I do have one quick question though, what curtains did you use? I have looked all over the Ikea website and can't figure out which ones. Any help would be greatly appreciated. Thanks for the great idea again! Beautiful room! I'm in love with your chandelier! Could you tell me where it's from? I've been searching for one just like that. Thanks. This is my sister's home and the chandelier is from Ballard. 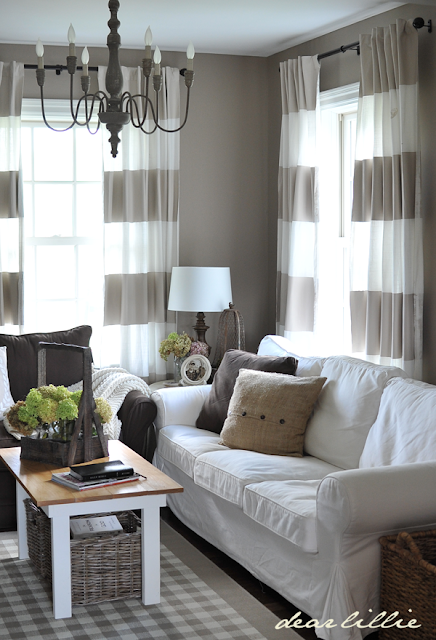 Love the color wall and curtains in your den! Can you tell me what color you used to paint the striped panels? 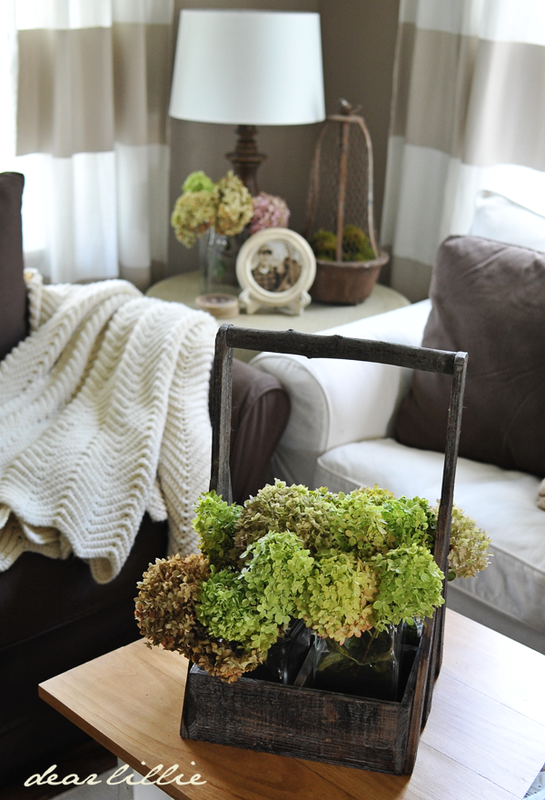 Can you tell is about where the side table is from with the burlap ? I think she got that tablecloth at Ballard Design but I'm not 100% on that. Can you tell me the color of Jamie and Josh's den? What color is Jamie and Josh's den. I have a tan house but I may switch to gray some day. I found you blog today and I love it! My house in maine seems similar in layout to your sister's. i also have similar windows and i was wondering if you know how she placed the brackets to hold up the curtain rods in relation to the windows? like how far above and to the left and right? My curtain rods are hung really close to the frames thanks to the previous seller and it looks awful with two curtains hung. Thanks! Thanks! I checked with Jamie and she thinks the brackets are about 4 inches above and four inches to the side of the windows. Hello! Could you please tell me what color Jamie used to paint the stripes on the curtains? Is it the same color as on the walls? Hello! Can you please tell me the color Jamie used to paint the stripes on the curtains? Is it the same color as on her walls? Hi Jess! Jamie is pretty sure she used Litchield Gray from Benjamin Moore for the curtains. Hi, I have painted 2 of my living room walls with the Benjamin Moore Cotswald color and I love it! However I can't paint the remaining walls that color because it will make the room too dark. I want to paint them a lighter shade. I went to the paint store to get the cotswald paint swatch to see what the lighter shades were but I was told that it was discontinued so they didn't have it.What colors do you suggest to use with the cotswald? Thanks so much! I love your stuff! Thanks, Chelsea! Honestly I don't really have any suggestions off the top of my head. I've never used the color myself, so I don't really know it well enough to guess what would go with it. Sorry! Chelsea, I like that Costwold myself. 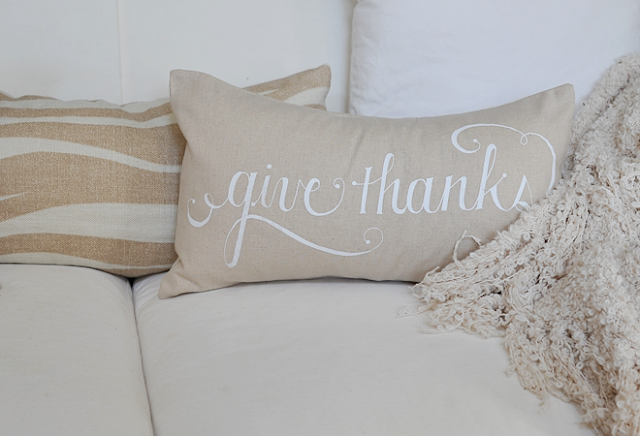 The lighter shades you can use are Tapestry Beige and Feathered Down. I go on BM website and those are the lighter shades they recommend. 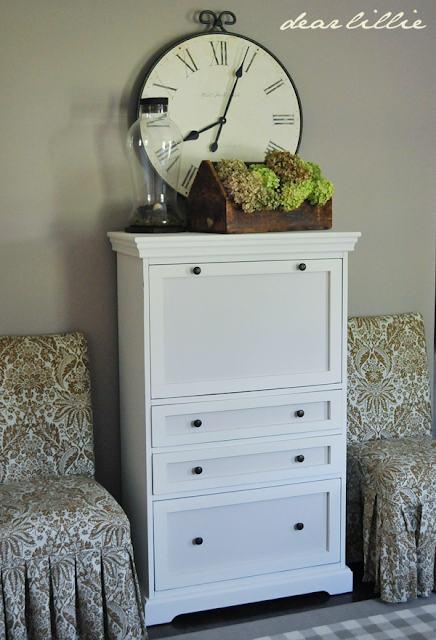 Hi, where is the taller white cabinet from - the one under the clock and in between the 2 accent chairs? Love everything about this room!! Thanks! It is from Ballard Designs. Can you tell me what color you painted the curtains with? Hi! 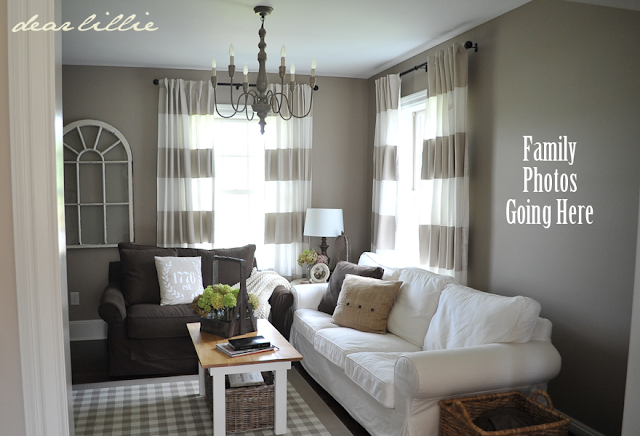 Jamie is pretty sure she used Litchield Gray from Benjamin Moore for the curtains. Awesome post! I really love your blog, keep up the great work here! Are the curtains hard after you paint them? Does the paint chip? Did you mix the paint with water?